With high-speed internet, you can stream HD videos, have greater access to the cloud, and improve your VoIP connection. One of the main value propositions of setting up a fiber connection is simply this: a faster business internet connection. This connection allows you to run applications and perform vital business processes that require greater internet speeds. With fiber you’ll have access to that high-speed connection and crystal-clear quality it provides, especially when communicating with people outside the office. Imagine chatting with your colleagues and clients via HD video conference, or collaborating on the project with contributors across the country with extreme clarity. For many companies, teleconferencing and video conferencing are vital tools for employee training, marketing, and sales. 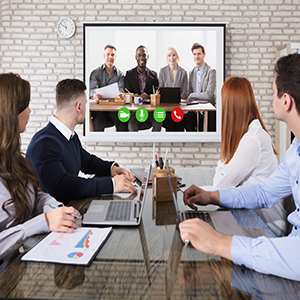 With a fiber-optic Internet connection, businesses can increase their investment in video conferencing as a business tool without sacrificing available bandwidth. Why? Because of reduced latency. With fewer delays, while processing data, fiber-optic Internet eliminates many of the latency issues users experience on cable Internet, particularly when downloading or uploading video or high-definition content. Research indicates that increased investment in video conferencing can save companies thousands of dollars per employees each year or even month, particularly if you’re able to cut out excessive business travel. From customer relationship management (CRM) tools to data storage, the cloud is an essential business tool for apps, hosting, and more. 82% of organizations are now using the cloud in some capacity. The speed and bandwidth capabilities of fiber Internet mean faster access to your data and applications stored in the cloud. Your business can benefit from fewer delays in accessing cloud-hosted information via your software-as-a-service (SaaS) tools and other platforms, which mean your sales and customer service representatives will no longer face delays with communicating with prospects or customers. As businesses move more and more services to the cloud, the fiber-optic Internet is becoming critical. Simply, VoIP — voice over internet protocol — allow you to make phone calls over the internet. Instead of hardwiring telephones to your employee’s desks, you can set up your phone system through an internet connection. This enables a superior communicating experience with modern calling features. This feature, coupled with a fiber optic connection, allows you to have improved quality of service, clarity of voices, and increased collaboration.